The world cruise fleet continues on an aggressive growth course and will reach 323 ships with an estimated annual passenger capacity of 25.5 million by 2019, up from 292 ships and 20.4 million passengers at the start of this year, according to the newly released 2014-2105 State of the Industry Annual Report from Cruise Industry News. Thus, the markets have to generate more than 4 million more passengers over the next five years – that is approximately the same growth rate as the previous five-year period. Hence, the focus on China, as North America and Europe are unlikely to continue at the same pace, despite what is regarded untapped market potential. Among the major companies, Carnival Corporation will grow its passenger capacity by an estimated 16 percent over the next five years, based on current shiporders. However, as Carnival is expected to place more orders shortly, which will increase its growth rate. Royal Caribbean Cruises will grow its capacity by an estimated 22 percent, Norwegian by 48 percent and MSC Cruises by no less than 64 percent, almost doubling its capacity. Combined, the four companies will continue to dominate the industry with about 83 percent of the total worldwide passenger cruise capacity. By the end of this year, the global fleet will have 296 ships, up from 292 last year, and represent a $33.8 billion industry, compared to $31.8 billion last year. The North American market represents 61.2 percent of the industry; Europe 29.9 percent; and the Asia/Pacific region, 8.9 percent – largely unchanged since last year. Published annually since 1988, the newest edition tracks industry growth by company, brands and markets, and forecasts through 2021. 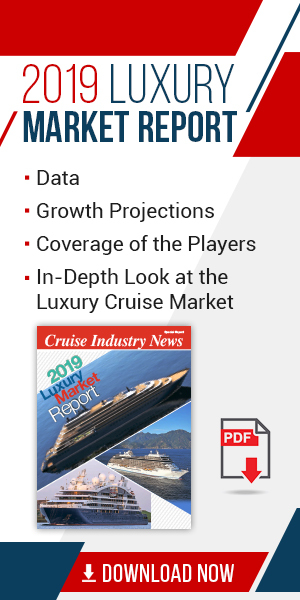 The 368-page 2014-2105 State of the Industry Annual Report from Cruise Industry News is available for $895 if shipped within the U.S. and $945 to all foreign recipients.